For all the bug haters, I’ve returned the favor: the buzz, whir and whine of a fly not getting the hint, is trapped in this caption pestering this picture. This blow fly of the Genus Lucilia was possibly the garden (or, at least as often is the case, “garbage”) variety green bottle blow fly. And truly, I did actually return the favor as this fly was busy feeding on the parsley in the garden (the white flecks visible on the eyes are not Diptera (“two wings”) dandruff, but pollen) while I rudely got in its face as close as I could get. In the end, the fly buzzed off and this shot proved, you can annoy a bug, but also, that good food makes everything better for a bug, too. 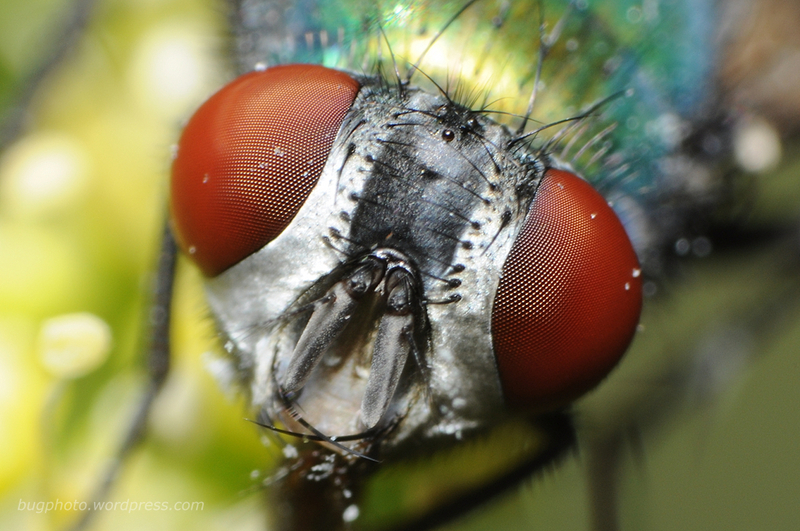 Posted in DipteraTagged blow fly, compound eyes, fly, green bottle, in your face, LuciliaBookmark the permalink. Wow, AMAZING shot! Can’t imagine how difficult it is to get a photo this close and this square on. Thanks, Harvey, but I should probably disclose that this shot is cropped (it’s the only cropped shot I’ve posted so far; all others are full frame). Sorry if that makes it less amazing! (It does.) It is tough to get a well placed bug face though. A lot of times I just have to take what I can get.